Pioneer Square: A Commuter's Paradise! With over 1,000 people moving to Seattle each week, our city is growing fast! And like two inches of skin showing at the bottom of a middle schooler’s jeans, traffic is one of the signs that we’ve outgrown some of our systems. Thankfully transit, ride shares, parking services -- and their user-friend apps -- are make getting around a whole lot easier. Environmentally friendlier options like car and bike shares are popping up everywhere. And lucky for us, Pioneer Square is right in the middle of it, making our neighborhood a commuters paradise! Street parking in Pioneer Square is metered, limited to 2hrs, and hard to come by during the work week. Our favorite place to park is the Century Field North Lot on Occidental, which is around $15 on non-event days. Or you can use this handy Downtown Parking map to find out which lots have space, and to see the lowest rates. Members have been talking up Parking Whiz, a new app that gets you a reserved spot at a discounted rate -- sometimes even in secure hotel parking lots with valet service. For the Pioneer Square Art Walk on first Thursdays, the Pioneer Square Alliance offers free parking in certain lots, as long as you get your parking stub validated in one of the excellent local galleries. Coming to the Square on the weekends? If it’s not a game day, you’re in luck! It’s mostly free street parking after 6pm on Saturdays and un-metered parking on Sundays. With all the car share options available in Pioneer Square, your ride is mere minutes away. When you rack up a good rider rating, Uber will offer you flat rates between one route -- like work-and-home. Another big favorite, Lyft, doesn’t offer flat rates, but does have a rideshare option that can cut your costs in half. Reach Now cars are easy to grab in the downtown core. Just sign-up on the app, check to see where your nearest car is, tap to gain entry and go! Done driving? Park at any legal street parking spot. No need to feed the meter -- Reach Now cars get a free pass! You can even take them to the airport and leave them at Wally Park, with a free airport shuttle. Our bike room, showers, day lockers, and towel service make biking to work a breeze. Use Google Maps and click the bike icon to get a route that maximizes dedicated bike lanes through downtown. Don’t have a bike or need to run errands faster than on foot once you’re downtown? Try one of the great bike rental services. Spin, Ofo, and Lime Bikes all offer on-demand rentals. You can try a ride for free, and most rent for $1-2 per hour. The app shows you where the bikes are located, and you can drop them off wherever your end your ride. Lime bike even has some electric options -- handy for those Seattle hills! Commuting by bus or train to Pioneer Square is a breeze! Several buses stop a few blocks away at 5th and Jackson -- where you can also find the LINK Light Rail station. The closest LINK station to tPC is the International District/Chinatown station, not the Pioneer Square station. Live on Capitol Hill? The Seattle Street Car is your go-to choice -- getting you from the hill to the square in just 18 minutes! 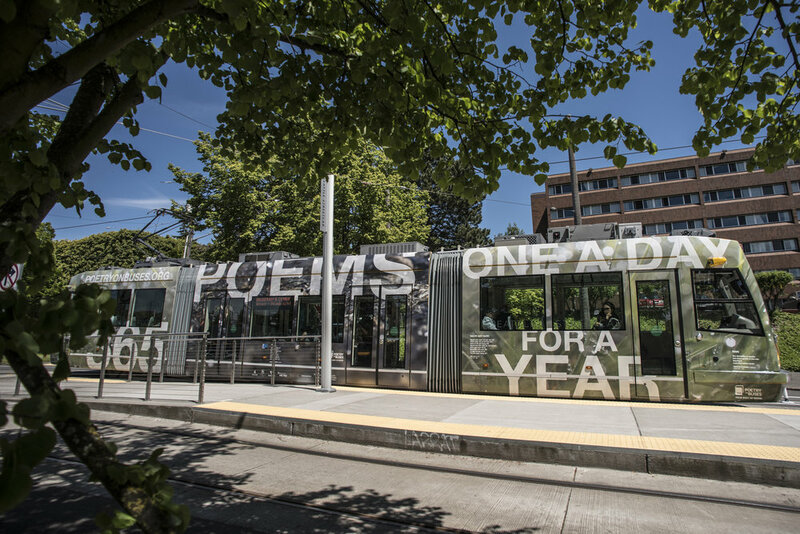 Maybe you’ll even hop the Poetry on Busses street car, and be greeted with poems about the life-giving nature of water, collected at Pioneer Square’s very own 4Culture. Not familiar with public transit? The Trip Planner from King CountyMetro makes planning your route a breeze. And apps like One Bus Away makes good use of GPS data to let you know your bus arrival in real time. Live in West Seattle or one of the islands? Travel by ferry is one of the area’s most iconic ways to commute. Or you can hop on the West Seattle Water Taxi, which combines with a shuttle on the West Seattle side to get you where you need to go. With all these options, it’s no wonder that only 10% of tPC members surveyed drive to work! Way to grow, Seattle!